Read the statement in Russian, French, or Spanish. “Government-ordered disruptions of communications networks and services are on the rise. The consequences of such orders can be as dire as the security threats they ostensibly target,” said Mark Stephens, CBE, Independent Chair of the GNI Board. They cut off citizens from essential information and contact with loved ones, impede the work of emergency and security services, and undermine economic activity,” he said. For more information on the Industry Dialogue, visit our website. Launched in 2008, the Global Network Initiative occupies a unique place in the global conversation about freedom of expression and privacy in the Information and Communications Technology Sector. The GNI is a multi-stakeholder forum that brings together information and communications technology companies, civil society (including human rights and press freedom groups), academics and investors from around the world to protect and advance freedom of expression and privacy. February 1, 2016 – The multi-stakeholder Global Network Initiative (GNI) and the Telecommunications Industry Dialogue (ID) are pleased to announce that seven global telecommunication companies will join with GNI to promote and advance freedom of expression and privacy around the world. From February 1st, Millicom, Nokia, Orange, Telefónica, Telenor Group, TeliaSonera, and Vodafone Group will have official observer status within the GNI. Observer status, which lasts for one year and precedes full GNI membership, is an opportunity for the ID companies to engage directly within GNI’s unique multi-stakeholder forum of ICT companies, human rights and press freedom groups, academics and investors. Read this statement in French, Russian and Spanish. The observer year will include hands-on participation in GNI committees and policy work, the sharing of best practices on conducting human rights due diligence and working together on a review of the GNI Implementation Guidelines to cover the range of companies in the ICT sector. During the observer period, the GNI will also observe and take part in ID Board meetings and events. Since 2013, the GNI and the Industry Dialogue have engaged in a collaboration focused on the challenges faced by ICT companies when government demands conflict with the rights to freedom of expression and privacy. Becoming official observers is the next step in this engagement. The agreed aim is that at the completion of the observer year in March 2017, these seven companies become full members – a move that would extend GNI’s global company constituency to encompass Internet companies, telecommunications operators and telecommunications equipment vendors. “We launched the ID in March 2013 to share knowledge on how to best implement the responsibility of telecommunications companies to respect freedom of expression and privacy. We have valued the close collaboration with the GNI over the past three years, and we look forward to bringing into dialogue nearly 50 diverse organizations to share lessons, build leverage and to promote these rights globally,” commented Patrik Hiselius of TeliaSonera, founding Chair of the Industry Dialogue. Unlike full members of GNI, observer companies do not participate in GNI’s independent assessment process, but become subject to GNI Principles and Assessment when membership is attained. In 2016, current ID members will continue to abide by the ID Guiding Principles. Founded in 2008, The Global Network Initiative is an international multi-stakeholder group of companies, civil society organizations (including human rights and press freedom groups), investors and academics, who have created a collaborative approach to protect and advance freedom of expression and privacy in the ICT sector. GNI has created a framework of principles and implementation guidelines based on international human rights standards and a high-level forum to deliberate on the challenges of corporate responsibility in the ICT sector. GNI member companies commit to, and are independently assessed on, their adherence to GNI Principles. Current company members are Google, Microsoft, Yahoo, Facebook and LinkedIn. Civil society members include Human Rights Watch, the Committee to Protect Journalists and the Center for Democracy and Technology. For more information on GNI’s members, principles and assessment, and on observer status, visit our website. I was pleased to represent the Telecommunications Industry Dialogue and Millicom at the Stockholm Internet Forum on 21-22 October 2015 and to interact with experts from around the globe on the topic of improving access to the benefits of the Internet. Together with the Global Network Initiative, the Industry Dialogue organized an “unconference” session on the subject of Making Freedom of Expression and Privacy a Key Part of ICT Development. Patrik Hiselius (TeliaSonera), Judith Lichtenberg (Global Network Initiative), Babette Ngene (Internews), and Marcin de Kaminski (SIDA) joined me in sharing perspectives on how donor, development and international financial organizations can incorporate freedom of expression and privacy into their ICT sector development projects in order to better ensure that the benefits of technology are genuine for the people they impact. From the perspective of Millicom, working in many countries that receive international aid and financing, such organizations can have real influence in promoting best practice and building local capacity. Our unconference session was inspired by the Telecommunications Industry Dialogue’s input to World Bank consultations on revisions to its Environmental and Social Framework in the first quarter of 2015. The Industry Dialogue recommended that the World Bank evaluate the risks and impacts to freedom of expression and privacy in a partner country prior to financing ICT sector projects and throughout these projects’ life-cycles. The evaluation would ideally include a review of the partner country’s legal framework related to freedom of expression and privacy. If the framework were unclear or inconsistent with international human rights standards, the World Bank could include mitigation strategies in its borrower’s Environmental and Social Commitment Plan. Additionally, the Bank could explore providing training and technical capacity-building aimed at making the domestic legal framework consistent with international standards and ensuring that government officials follow them. Unfortunately, the second draft of the World Bank’s Social and Environmental Framework did not incorporate our suggestion. The absence of safeguards or policies related to human rights has been the subject of criticism from UN Special Rapporteur on extreme poverty and human rights Philip Alston, who has recommended that the World Bank adopt a human rights policy. At a minimum, Alston counsels the Bank to adopt a “due diligence policy to enable it to adjust or reject projects that would otherwise lead to, or support, human rights violations.” Human Rights Watch has also recommended that the World Bank assess risks to freedom of expression, privacy, and other fundamental rights prior to approving projects with ICT components and throughout the project life-cycle, that it adopt mitigation strategies, and that it raise concerns with government officials regarding censorship, illegal surveillance, and network shutdowns. We are grateful to SIDA and the participants of the 2015 Stockholm Internet Forum for providing the Telecommunications Industry Dialogue with the opportunity share our challenges and work with the participants. The Industry Dialogue and the GNI would be pleased to share the lessons that we have learned with other donor or international financial institutions. We would also welcome the chance to work with SIDA to increase company participation in next year’s Stockholm Internet Forum and to share ideas as to how the Forum could provide more opportunities for interaction and trust building between different stakeholder groups. The Telecommunications Industry Dialogue is pleased to be attending the Stockholm Internet Forum on October 20-22. The Industry Dialogue and the Global Network Initiative are hosting an Unconference session on Wednesday, October 21, entitled Making Freedom of Expression and Privacy a key part of ICT development. This dynamic discussion will explore how donor and development organizations can incorporate freedom of expression and privacy into their ICT sector development projects to better ensure that technology benefits the people. How can these organizations work with others in the ICT space to design and implement projects in a way that respects human rights? What lessons can be learned from company due diligence procedures? Please join us and share your perspective. 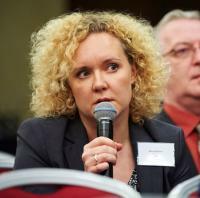 The Industry Dialogue will be represented by its former chairs, Milka Pietikainen of Millicom and Patrik Hiselius of TeliaSonera. GNI Executive Director Judith Lichtenberg will join us and also speak at the main session on Thursday, October 22 at 9:00 entitled All of the Internet for all of the people. Here is the full schedule.